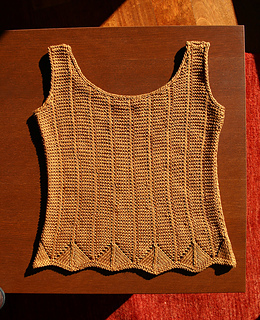 This elegant top is written for sizes from Small (31”) to XL (57”) and spans almost every number in between by switching needles to change the gauge. Lots of detail in the instructions, a chart, suggestions for yarn subs, etc. 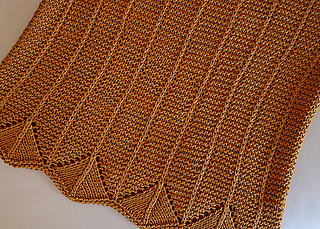 “The intricate ornamentation of ancient Etruscan jewelry was the inspiration for this top, in which a lustrous gold-colored yarn and the varied surfaces of garter stitch, a simple lace border, and slipped stitches combine to create a richly textured fabric. 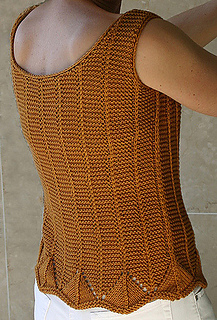 To keep the border stitch pattern complete, no partial repeats were used, limiting the number of sizes to four; to fit a wider range of measurements, dimensions are given below for these sizes worked in four different yarn gauges, and a number of yarn substitutions are suggested (some of which I have swatched). Knitting progress is given both in inches and in rows, so that a yarn of a different gauge than that pictured can be easily substituted. Note that if yarn is substituted, yarn requirements are a rough guide only! Intermediate: skills include reading chart, increases/decreases, three needle bind off, and picking up stitches for neckband and armhole trim. 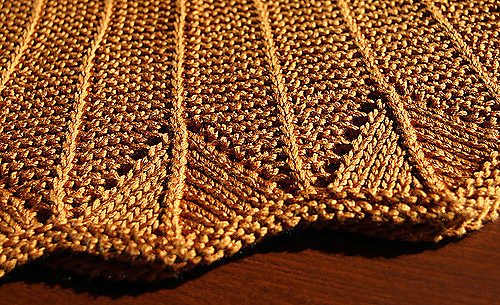 Yarn: Karabella Empire Silk (100% silk), color 504 deep gold, 6 (7, 9, 10) skeins, or 540 (630, 810, 900) yds. Needles: US size 7/4.5 mm circular needle, 24” US size 7/4.5 mm straight knitting needles. Adjust needle size if necessary to obtain correct gauge. Same gauge/needle size as above: Berroco Touche’ (cotton/rayon), suggested color 7912 Dijon; Classic Elite Premiere (cotton/Tencel), suggested color 6212 Mimosa. For Other Gauges: Tilli Tomas Fil de la Mer (silk/seacell) on US size 6 needles for 21 sts to 4” in EG patt, suggested color Goldenrod; Berroco Touché on US size 8 needles for 18 sts to 4” in EG patt. Or try these (not swatched by me): Louet Euroflax on US size 5-7 for 18-22 sts to 4” in st st, color Mustard; Berroco Ultra Silk (rayon/nylon/silk) on US size 10 for 19 sts to 4” in st st, suggested color 6113 Dijon. Note that sizes S (M, L, XL do NOT necessarily correspond to the sizes given in the CYC standards--garment measurements vary depending on yarn chosen.